Kuwait's ailing emir, Sheik Saad Al Abdullah Al Sabah, has agreed to abdicate under a deal worked out within the ruling family, a lawmaker said Monday. The abdication paves the way for the prime minister and longtime de facto ruler, Sheik Sabah Al Ahmed Al Sabah, to become the country's new emir, and ends an unprecedented public quarrel inside the ruling family. "An agreement has been reached in the family and he will sign the abdication papers tomorrow," lawmaker Nasser al-Saneh told The Associated Press. A government official who did not want to be identified because of the sensitivity of the issue confirmed the abdication and said it was unconditional. "It was an agreement in Kuwait's interest. It spared the country a lot of complications," he said. An official announcement of the abdication was to be made Tuesday. The royal family had been split since the Jan. 15 death of the previous emir, Sheik Jaber Al Ahmed Al Sabah. Under the constitution, Crown Prince Sheik Saad automatically became emir, but most of the family and lawmakers questioned his ability to rule because of failing health and supported Sheik Sabah to take his place. The push for Sheik Sabah's ascension, however, was snarled when some members of Sheik Saad's branch of the ruling family objected. A swearing-in ceremony for Sheik Saad had been planned for Tuesday evening. Many Kuwaitis have voiced fears Sheik Saad would be unable to recite the full oath of office stipulated by the constitution. Since he succeeded his distant cousin just over a week ago, he has appeared in a wheelchair and has not spoken in public. Al-Saneh said the two struggling camps of the family met Monday evening in order to reach a compromise before a parliament session Tuesday that was to debate Cabinet demands that the ailing new emir relinquish his position. The catch now is that the new emir has not yet named his successor, or crown prince, and so the mechanics of the power transfer to Sheik Sabah are not clear. Sheik Sabah has been running the day-to-day affairs of the country since the late emir and the then-crown prince, Sheik Saad, both fell ill.
Sheik Jaber suffered a brain hemorrhage in 2001, and Sheik Saad's health started to deteriorate after he was treated for a bleeding colon in 1997. The leadership crisis began coming to a head on Friday when scores of ruling family members visited Sheik Sabah at his residence and asked him to take charge of the country. He accepted the draft, which was widely seen as approval of his becoming emir to replace Sheik Saad. The push for Sheik Sabah's ascension, however, was snarled when some members of Sheik Saad's branch of the ruling family objected. Key among them was Sheik Salem Al Ali Al Sabah, chief of the national guard and the oldest member of the family. His status of family elder added particular weight to his objection. But the Cabinet — which backs Prime Minister Sheik Sabah Al Ahmed Al Sabah — had declared the government's stance that the emir "has lost the ability to perform his constitutional duties" and parliament was prepared to debate the issue Tuesday. Some lawmakers had planned to boycott the session, hoping the ruling family would find a last-minute compromise. "Lawmakers don't want to take sides," Islamist legislator Walid Tabtabai, told reporters. "I never wanted things to reach the point of removing his highness the emir," Hussein al-Qallaf, a Shiite cleric and lawmaker said. "It is difficult and it weighs heavily on all legislators. 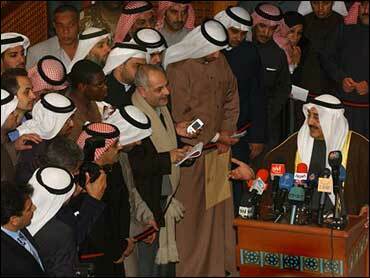 Sheik Saad is loved by all Kuwaitis." The ailing emir is the son of Abdullah Al Salem Al Sabah, who is known as the "father of democracy" and the founder of modern Kuwait. Kuwaitis, who are used to smooth succession, were also hoping for a last-minute compromise by the ruling family. The country's press has sided with Sheik Sabah. "Things are as clear as the sun. The family has pledged allegiance to Sheik Sabah to run the country and he is qualified for that," wrote Al-Watan in its front-page editorial Monday. "Go (ahead), your highness Sheik Sabah, and we will follow and support you."